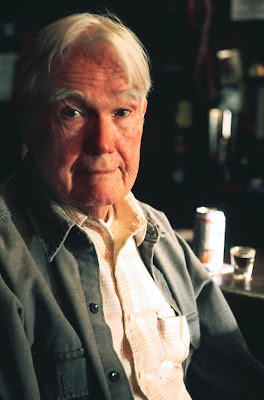 The picture at left shows Bob Heffernan in character as "the old drunk" in Peter Callahan's 2001 film, "Last Ball." He is sitting in the gloom of John's Bar and Grill, an old ungentrified saloon on Warburton Avenue. The film, written and directed by Hastings native Peter Callahan, is an autobiographical "coming of age" film shot in and around Hastings. In the process of depicting Callahan's story, the film preserves many things that are now lost or changing, among them St. Stanislaus Kostka, Junior's gas station and the old community center, all on Main Street. This is significant to me, because I first met Bob in front of Junior's and across the street from St. Stanislaus. I was heading East and he was heading West, to the heart of the village. He looked up at me, smiled and gave me a warm hello. The sight of him jarred me out of my chronic reverie and I smiled back. I didn't know who he was, but I felt that I should, as if he were a celebrity or elected official. I continued to meet and greet him now and again in passing on the street or in the Hastings Center Restaurant, our local diner, but I did not learn his identity until I shared a table with him at the after-Mass coffee social in the basement of St. Stanislaus. He introduced himself and gave me his calling card, a plastic wallet calendar with his head shot, union memberships and contact information. He was an actor. Over time we all got to know and enjoy him. He regaled us with anecdotes about actors, productions, Sardi's and the Lamb's Club. Most importantly, he laughed and joked. Bob brought a brio and panache to the ensemble of St. Stanislaus, lending memories, wit, humor, kindness, play and a touch of glamor to the parish. Over time we also got to meet his three daughters, singly or as a group, when they attended Mass and coffee social before escorting him to some occasion. In May of 2004, after we had heard that St. Stanislaus was in danger of closing, we decided to celebrate our existence by marching in the annual Memorial Day Parade. Bob graced us with his presence, handsome in his Panama hat, waving from the Sherkus' convertible like a kindly monarch. In the fall of 2006, Bob suffered an illness that took him away from us for a while. At this time, one of the weekday Masses at Our Lady of Vilnius was offered for the intention of his health. Bob eventually returned to us, weakened, but in good spirits and accompanied by a care taker. On Monday, the St. Stanislaus Kostka Holy Rosary Society included him in their prayers, having heard that he had suffered "a little setback." This Wednesday I was saddened to receive a an e-mail informing me that Bob was "called home to God." Bob's obituary was published in yesterday's Rivertowns Enterpriseand today's Journal News. These tributes describe him as a parishioner of St. Matthew's. Maybe he was, but I will always remember him in the context of St. Stanislaus Kostka. And I will remember him when I pray outside of Our Lady of Vilnius, wherein we once prayed for his health. I just came across this beautiful tribute to my dad.